Purchased with the support of Art Fund, the Friends of the V&A, Stephen and Anne Curran, the American Friends of the V&A, the Gilbert Trust for the Arts, Dr. Susan Weber*, The Leche Trust, the Audrey Love Charitable Foundation*, the Gilbert Public Arts Foundation Trust*, The Furniture History Society, The Society of Dilettanti Charitable Trust, The Cahn Family Foundation*, Nicholas and Lady Goodison’s Charitable Settlement, and many other donors. 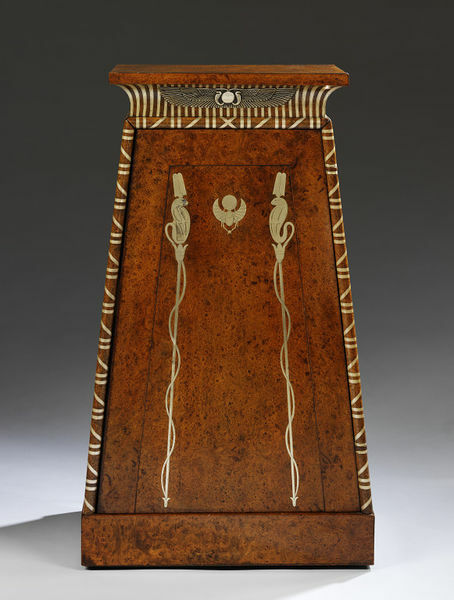 This medal cabinet is an important example of the Egyptian style which was so popular in Europe and North America in the years from 1800-1815. Made by Martin-Guillaume Biennais (1764-1843), the French Imperial goldsmith, the cabinet's design is closely related to a drawing by the French artist and writer Dominique Vivant-Denon (1747-1825). Denon's drawing, of the ruin of an Egyptian temple pylon at Apollonius Parva (now Qus) in Upper Egypt, was published in 1802 as plate 80 in Voyages dans la basse et la haute Égypte - his very influential account of Napoleon's first Egyptian military campaign (1798-1801). The cabinet's design combines flat planes of highly-prized burr amboyna (or thuya) veneer with inlaid silver mounts. Both materials were expensive and needed to be very carefully worked. The workmanship here is of the highest quality and the cabinet provides its user with delights and surprises: the single door is opened by poking the eye of one of the uraei (a stylised cobra form), which reveals a keyhole. The unlocked door then opens to show 41 narrow drawers designed to hold medals. Each drawer is opened by lifting the right wing of an inlaid silver scarab or bee, located at its centre. Medals were a very important part of Napoleonic collecting. Newly-minted medals were a significant part of Napoleon’s propaganda and were struck to commemorate his major achievements. Both Napoleon and Denon, his Master of the Mint, were also enthusiastic collectors of ancient medals. While it is not known who this medal cabinet was made for, it must have been a very important comission. Oak case, veneered with amboyna or thuya burl wood. The interior of the cabinet, where the drawers are housed, is veneered in mahogany. The drawers and drawer runners are of solid mahogany. A small band of ebony stringing runs around the top edge of the cornice. The cabinet is inlaid with engraved silver mounts. On both front and back, a silver scarab, supporting a sun, sits at the centre top of the cabinet. This scarab motif is flanked on either side by two ureai (cobras) entwined around lotus stalks. On each of its four sides, and running around the lower edge of the cornice, rounded mouldings are inlaid with engraved silver banding. Inlaid strips of silver run vertically around the cornice. The cornice is also mounted, on all four sides, with a silver plaque formed as an Egyptian winged disc - on these discs a sun motif sits between two wings, the sun is flanked by two cobras. The cabinet's design makes no distinction between front and back. It opens with a single door, which makes up the entire front panel of the case. The door, hinged into the right-hand moulding, is concealed through a clever locking mechanism - on the cabinet's front panel, the eye of the left-hand cobra can be depressed. Once pushed in, the body of the cobra falls away to reveal a key hole. The cobra's body then acts as a door pull. The cabinet contains 41 dovetailed drawers. The drawers are trapezoid in shape, tapering towards the back. They are in two sizes - the top 21 drawers are 1.27 cm high and the lower drawers are 1.905 cm high. Each drawer is mounted at the centre of its front edge with an engraved silver scarab (or bee). The right-hand wing of this insect flips forward to act as a drawer pull. The drawers are also each mounted on their inside top edge with a numbered silver plaque. The cabinet stands on four low feet. It was acquired with a later plinth, also veneered in amboyna or thuya wood. Although apparently contradictory, the use of a standard mark for 1793-4 is common in Parisian metalwork of the post-revolutionary period – this mark was used as a private ‘essai’ mark, and is often found next to the goldsmith mark until1830. The cabinet is also signed by Biennais on its lockplate: ‘Biennais, Orfre de LL. M. M. Imples et Royles à Paris’ [Biennais, goldsmith to their Imperial and Royal Majesties in Paris]. The cabinet's upper section is clearly based on a drawing of the ruin of an Egyptian temple pylon at Apollonopolis Parva (now Qus) in Upper Egypt. This drawing was done by by the French artist and writer, Dominique-Vivant (later Baron) Denon (1747-1825). Denon, one of Napoleon's closest advisors, accompanied Napoleon's first military campaign to Egypt (1798-1801). He published an account of the voyage on his return to Paris - the drawing of the temple at Qus was reproduced as plate 80 in this book, Voyages dans la basse et la haute Égypte (Paris, 1802). In addition to Denon's drawing there also exists, in the collections of the Musée des Arts Décoratifs in Paris, a presentation drawing which appears to be for the cabinet. Attributed to the architect Charles Percier (1764-1838), this drawing shows the cabinet's unusual combination of burr wood veneers with silver mounts: http://opac.lesartsdecoratifs.fr/fiche/projet-de-table-de-nuit-avec-bronzes-dapplique-0 (Accessed 29/09/2014). The drawing is part of an album of designs which on its cover is inscribed ‘for Biennais’, i.e., Martin-Guillaume Biennais, the Imperial goldsmith. Percier is known to have executed many designs and drawings for the Biennais workshop. While the cabinet has previously been attributed to the Parisian cabinet-making firm Jacob-Desmalter et Cie, with mounts by Biennais, it now seems more likely that it was made in its entirety in or for the Biennais workshop. It does not bear the stamp of any other maker, and Biennais is known to have provided wooden objects including medal cabinets for both Eugène de Beauharnais (1800) and the Empress Marie-Louise (1812). In February 1814, Biennais submitted an account for 3,600 francs for a ‘médaillier du Roi’. In an article published in 1991 (see references), Antony Griffiths suggested that this bill may well refer to a closely related mahogany medal cabinet in New York’s Metropolitan Museum of Art, which also bears marks on the silver for Biennais: http://www.metmuseum.org/collection/the-collection-online/search/195473 (Accessed 29/09/2014). In 1788, after training initially as a turner, Biennais was made master tabletier (a maker of small luxury goods for personal and travel use, using wood, mother-of-pearl, ivory and metal). He opened a shop in Paris that same year. Biennais’ business was very successful and he quickly managed to diversify the firm’s production, expanding first into small-scale cabinet-making and then into goldsmithing. Biennais was the leading goldsmith of the Empire period and was given official patronage by the Bonaparte family. He often combined rare and fine veneers with exceptional metal mounts. His imperial commissions include a number of pieces made in root wood, and in 1810 he supplied to the Empress a secrétaire in burr wood mounted with plaques of engraved silver. It is not known who this medal cabinet was originally made for, but it has been in Britain since the early to mid-19th century. This cabinet is an excellent example of the Egyptian style which was popular in Europe and North America in the years 1800-1815. In addition to its Egyptian pylon form, the design uses a number of Egyptian motifs, including the paired ureai entwined on lotus stalks on the cabinet’s front and back, the scarabs sitting between these stalks, the winged discs on the cornice, and, depending upon interpretation, the scarabs on the drawer pulls. Egypt was of great strategic significance to both French and British military campaigns of the late 18th century. Egyptian motifs were frequently republished and redeployed throughout this period, and their use cannot be separated from these early 19th-century European imperial politics. Despite the military failure of Napoleon's Egyptian campaigns, an extremely successful programme of French propaganda managed to present the expedition as a cultural triumph. Denon's book was central to this campaign - in part because it spread and popularised a large number of Egyptian motifs and forms. Napoleonic design used symbolic motifs more generally to both establish the individual power of the Emperor and also to claim imperial inheritance from ancient civilisations. 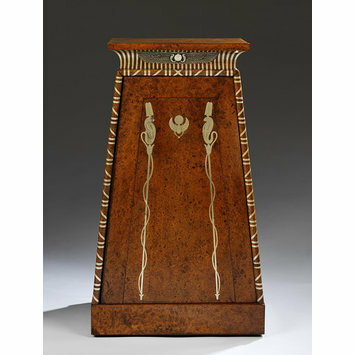 Although we don't know who comissioned this cabinet, its motifs suggest that it was made for an important French owner. The winged disc on the cabinet’s pediment represents the Sun and signified divinity and royal power in ancient Egypt. It is often found at the entrances to courts and temples, usually flanked by ureai (as here, and at Qus). The scarabs on the cabinet’s front and back (and potentially on the drawer pulls) symbolize self-creation or rebirth. If the pulls are bees, then they link to a separate group of Napoleonic symbols: the bee was one of the central motifs of Napoleon’s reign, used to link the Emperor to the French Merovingian king Childeric I (about 440-481 AD). Newly-minted medals were a significant element in Napoleon’s propaganda and were used to commemorate his major achievements. Both Napoleon and Denon, who was his Master of the Mint, were enthusiastic collectors of ancient medals. Cabinets such as this would have been made to house both Napoleonic and ancient medal collections. Antony Griffiths, ‘The End of Napoleon’s ‘Histoire Métallique’. Part III’, Medal, no. 18 (Spring 1991). This cabinet for medals was probably made for someone in Napoleon’s circle. With its stark architectural form and intricate silver decoration, it is one of the finest examples of Empire style furniture and of the taste for all things Egyptian. The design was based on a drawing of a ruined temple in Qus by the artist, collector and diplomat Dominique-Vivant Denon, who accompanied Napoleon’s military expedition in Egypt.